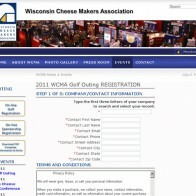 Golf Outing Registration/Sponsorship Developed - Amplitude Design, Inc.
Amplitude Design, Inc. developed the registration web site for the Wisconsin Cheese Makers Association’s 2011 Golf Outing. The response was tremendous with 357 golfers registering the first day. This was the first year the association took online registration. If you would like to speak with us about achieving similar result please click here.